So much to do and so few hours in the day! That's how I feel. Before talking about today, here's what I did yesterday. I spent the start of yesterday listening to a great podcast between Julie Fei-Fan Balzer and Ronda Palazzari. 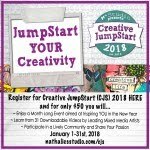 Julie has started a series called "Adventures in Arting," and Ronda was her first guest. Ronda will be Carolyn Dube's and my first guest on Fall Fearless & Fly, the "art cleanse" starting 10/1 on Artists in Blogland. It was so interesting to hear Ronda's and Julie's perspectives on fear of failure, and what exactly is success, as this is so much what the fall challenge is all about. 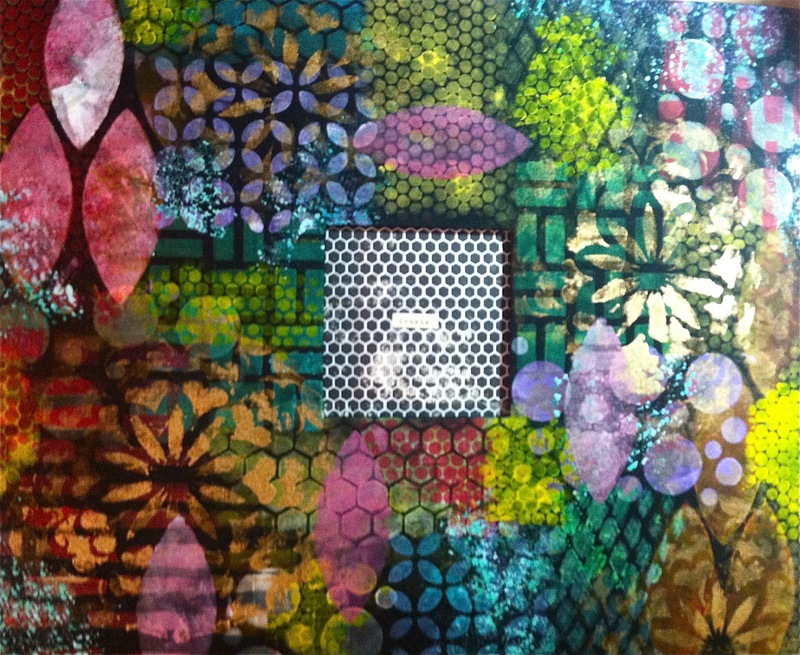 As I listened, I stenciled the cover of my new stencil storage book. Ronda had a great tutorial on her blog about this, and I was so excited to try it. 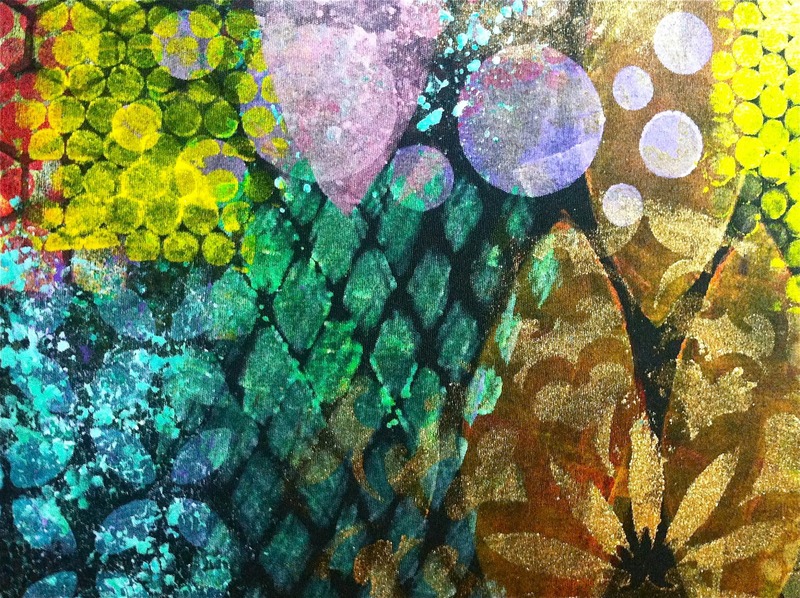 I love how it turned out, and it's so nice to have all my stencils stored in one place! I used regular craft and fluid acrylics, and am loving all the colors. Smeared more leftover red and green paint on copy paper and then cut the papers up to make hearts, stems and leaves, to create this page. Yesterday, I only had 3 students in my 4:30 yoga class because it was back to school night in our area. Because it was such a small group, we were able to really take time and delve deeply into the poses. I was able to give each of them a lot of individual attention and hands-on adjustments. I felt like I was of great service to them -- I helped them get a better understanding of their bodies and breath through very detailed work. They were so grateful, and I was so grateful. And this made me happy. Love truly grows by giving. 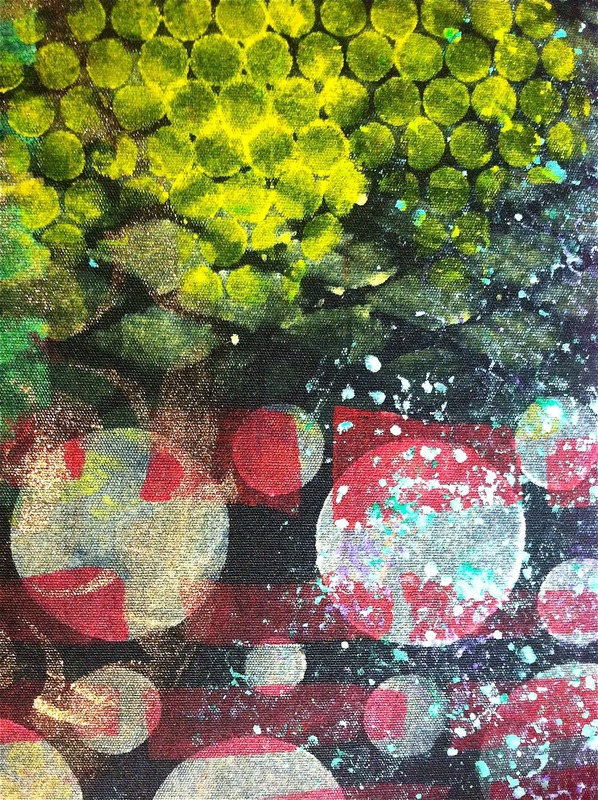 I took a canvas I had previously painted but didn't like, and added some stencils, sponging, splattering, etc. I was pretty random with this. I knew this layer was going to be behind, and peek through the openings in the doors. I typed this saying: "be an opener of doors...every exit is an entrance to somewhere else" using the American typewriter font and printed it out on white card-stock. 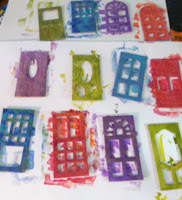 I added black and white detail on all the doors and windows, as well as some stenciling with TCW's mini-heringbone and mini-hexagon stencils (designed by Balzer Designs), to add more texture. 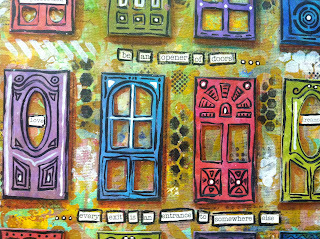 The numbers across the top are plaquettes by Tim Holtz. I used "82" in honor of my dad - who is a young and vibrant 82 and still plays a mean game of tennis! (I didn't use one for my mom's age because she likes to keep that a secret.) UPDATE - I want to make clear that this is my dad and MY MOM - not me! I know it's confusing - I am lucky to look a lot like her! I am busy setting my table and polishing my best silver for the Fairy's Tea Party on Sunday. I hope you'll visit me and all the other artists participating. 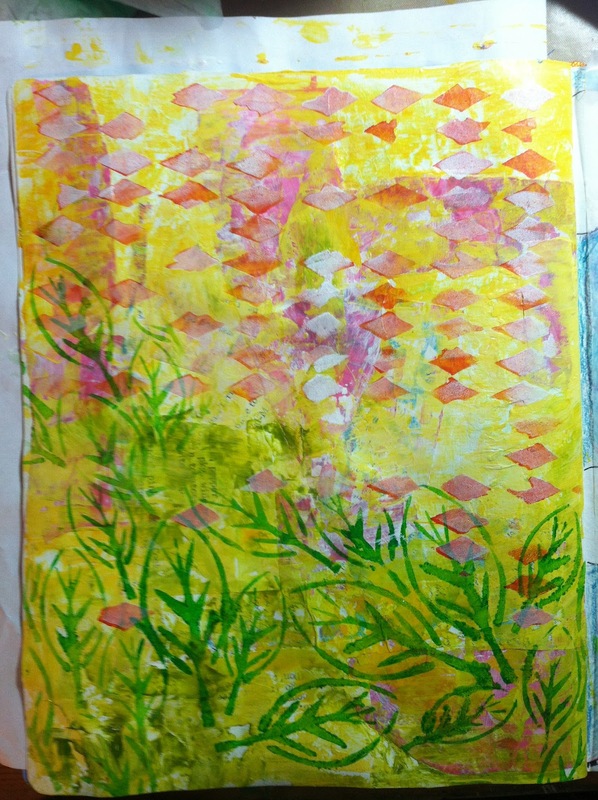 One of the commentators to my tea party blogpost will win an original watercolor - you can see and read about it here. 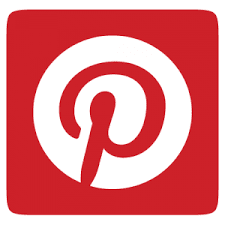 As always, Happy Paint Party Friday, Creative Every Day and Inspire Me Monday! Great plays in your journal. 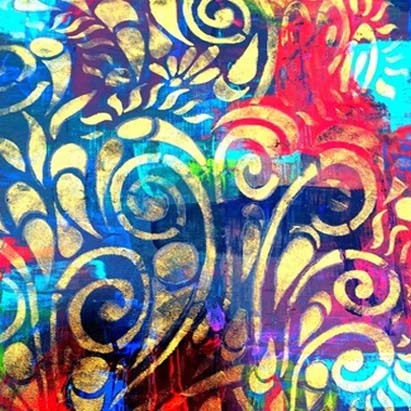 Such vibrant colors and lovely textures! Lots of color, great pages. Love all the variety. Your mom looks great too. Happy PPF! Oh Jessica, everything is just gorgeous!! 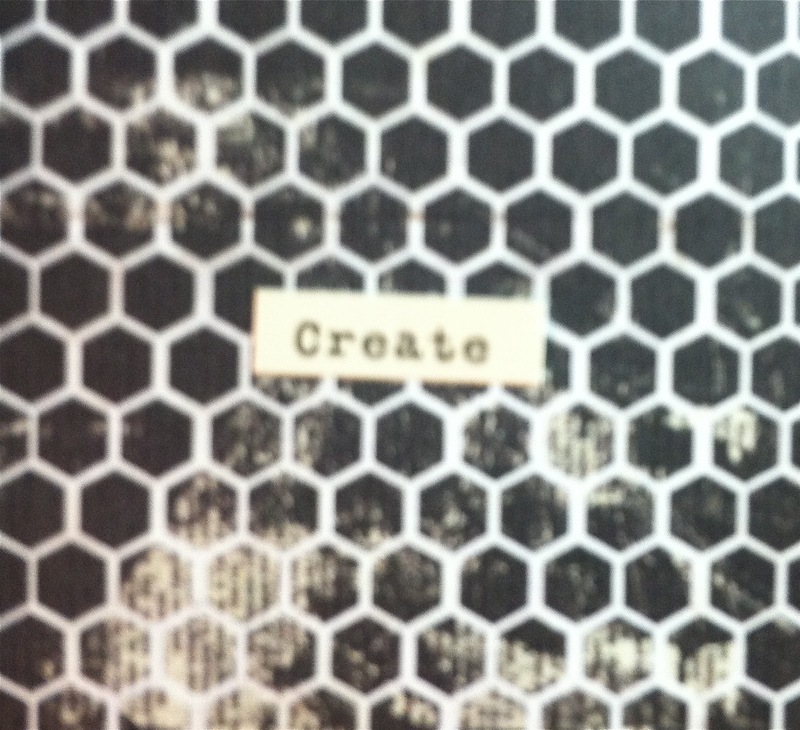 I too saw Rhonda's stencil book and loved the look. It's on my list to try...I have so many stencils that I haven't used yet and I thought that was the perfect way to get them ALL inky and into circulation! Hoping to get to it today! And the doors...I just saw those yesterday in the store, looked at them for a while and passed them up because I couldn't figure out what to do with them. I must have them now!! Thanks for the inspiration! ahh - I love this so much! 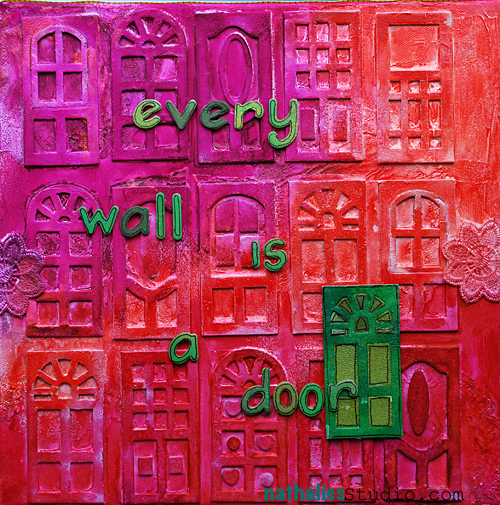 Beautiful saying- and I love the doors. awesome!! Thank you so much for sharing! My Gosh! 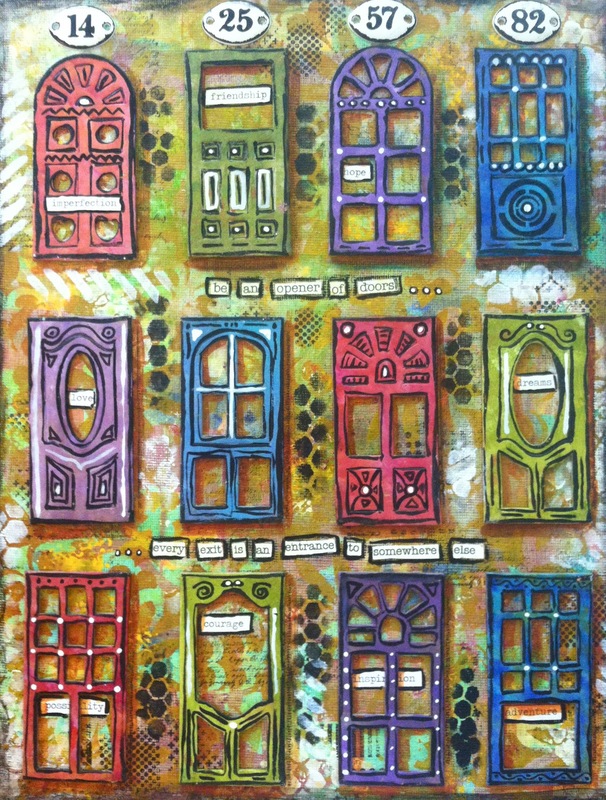 I love your doorways! You have such a distinctive and playful style Jessica! I love your work! Beautiful art Jessica!!! 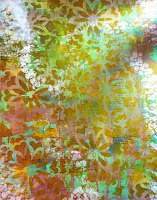 Your stenciled journal is fabulous and your whimsical doorways and flower pages are colorful and fun! Wonderful layers and textures in your works! I just love the doors. They look so animated... and the colors are so fun and vibrant. 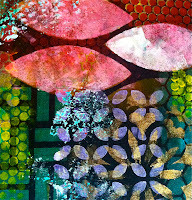 I love stencils, especially using molding pastes and making some great textures with them. You are inspiring, Jessica. lovely work this week Jessica! Wow! You've been so busy! Gorgeous colours. 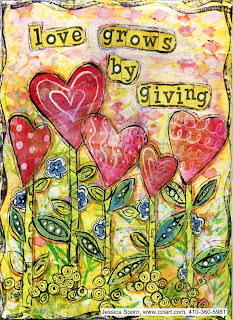 Love the journal page about loving and giving. So true. Another wonderful juicy post filled with wonderful info!! 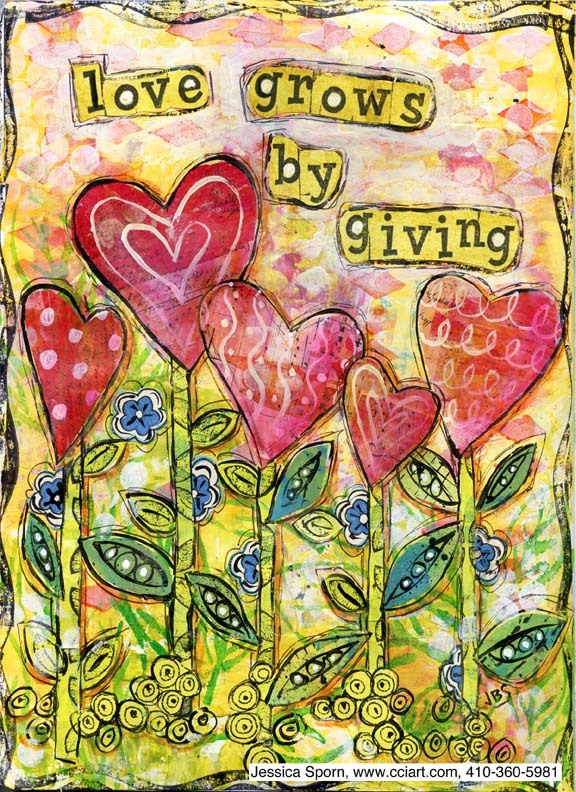 Love your stencil journal and your love grows by giving too....so true!! Of course the doors have me all the way...love them!! Very inspiring post! Oh and I forgot to say I love the photos of you and your dad! What a gorgeous looking family you are!! thank you, but that's my mom! I know she and I look a lot alike. LOL! So much goodness here! I too am getting excited about Fall Fearless and Fly!! Your doors here are simply stunning!!! Love how you took Natalie's idea and made it your own! I'm overload with LOVELY textures and colors here!..makes me happy :). Your mom and dad are so endearing, and you have her great smile too! wow you are so very much like your mother, your parents look wonderful. Lots of fun playful colors here. Love the heart flowers. 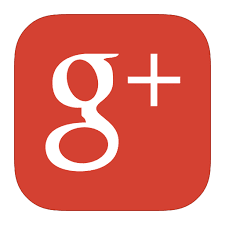 Thanks for your comment on my blog post. HPPF. Great color combinations and wonderful designs inspired by nature, I like. Wow, you and your mom look so much alike! Both lovely ladies. 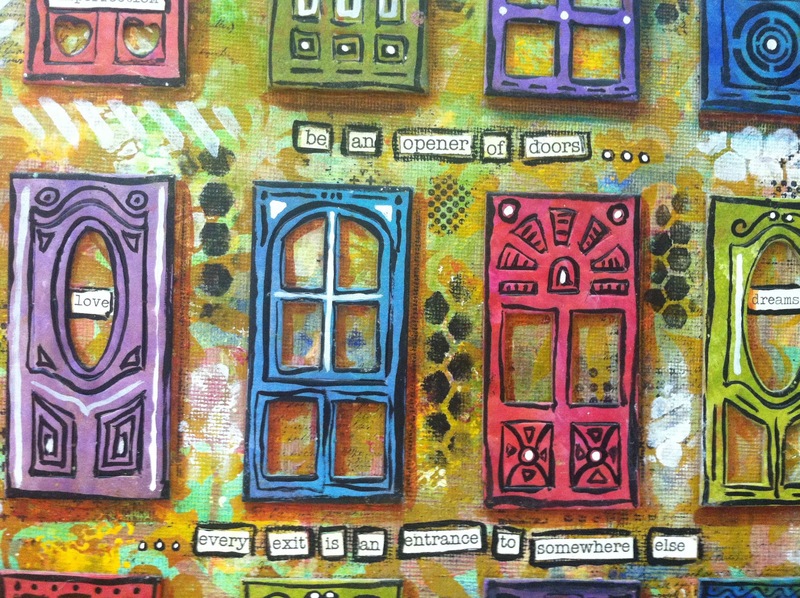 I really like the journal page and the door project. 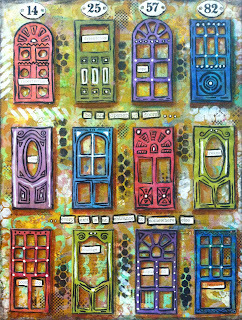 I kind of have a thing for doors and windows! Great post - Chock full of gorgeous, inspiring work!! I need to hear that podcast! I love those doors..I love that quote too! The process you have written about is very interesting to self taught persons like myself. Lots of good wishes to your parents! I love their happy smiles! You are lucky! That is just sooooooo beautiful. Love everything about your art. You are just soo passionate. I haven't visited your blog in a while and just don't feel creative when u don't visits other blogs. I am so fascinated and inspired by all your wonderfully creative projects. 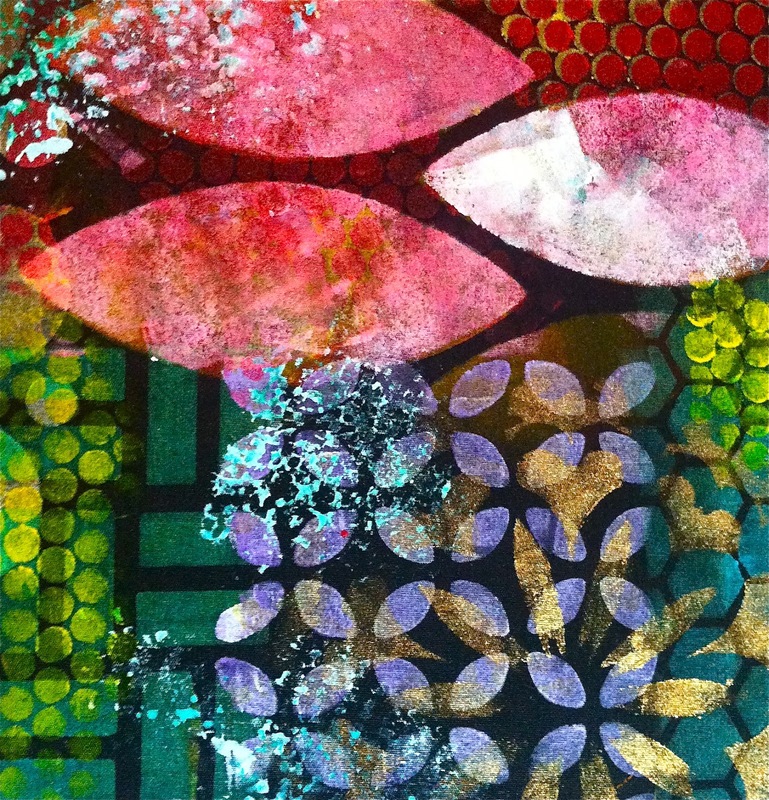 I just bought some stencils and tons of stickers, copic markers, silks, h2o's, and mediums by Golden because i joined a Artist Trading Card club. 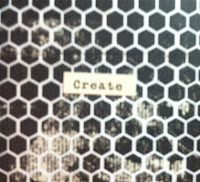 But I actually have no idea how to get started with planning a project that involves layers and bits and pieces! I am petrified! Now I bought all this stuff and have no idea what to do with it!. Your doors project is great! 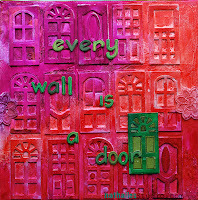 Also I keep hearing about Tim Holtz, so maybe have to go to that site... Have a wonderful week. Your post sure was full of eye candy! Love those pages and am really looking forward to your October challenge with Carolyn. Your stencil journal cover is gorgeous! Your door piece is truly amazing! The picture of your parents is sweet, and agree that you are blessed to look so much like her. 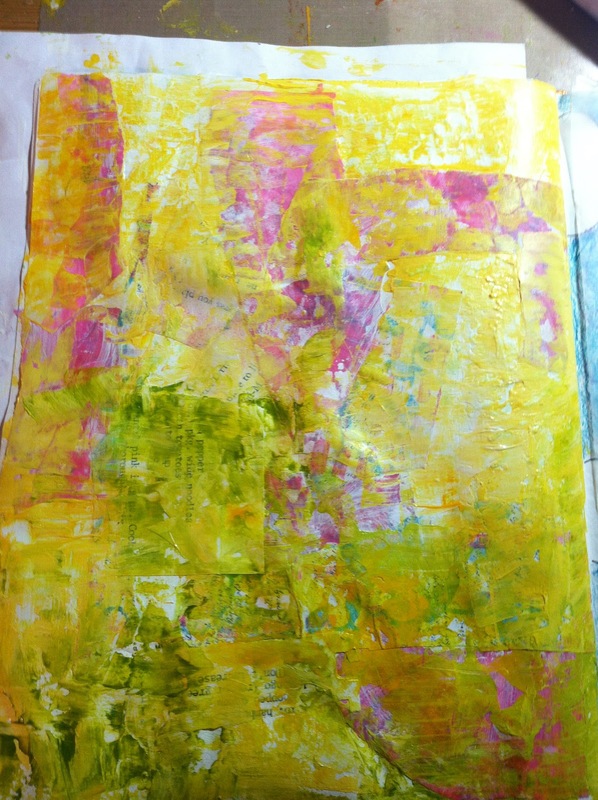 I don't like wasting paint either, so I use it to paint papers that I later use for collages. Blessings! 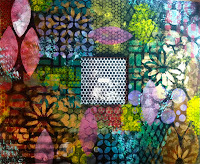 Jessica, your pieces are amazing and it inspires me to try new things even if it is just random! Love the play of colors and texture and chip boards! Great outcome. Lovely, Jessica! Thanks for sharing your art and yoga. Very inspiring! Oh my goodness!! I am so inspired. Your art is wonderful and the stencil album is fantastic. But I am partial to doors so it's my fav!! Found you through Artists in Blogland. Glad I did. Gorgeous results with the templates!